Hashilla Rivai has moved to the top spot on the Golden Trojans' golf team. SACO — Hashilla Rivai loves being on a team for the first time. 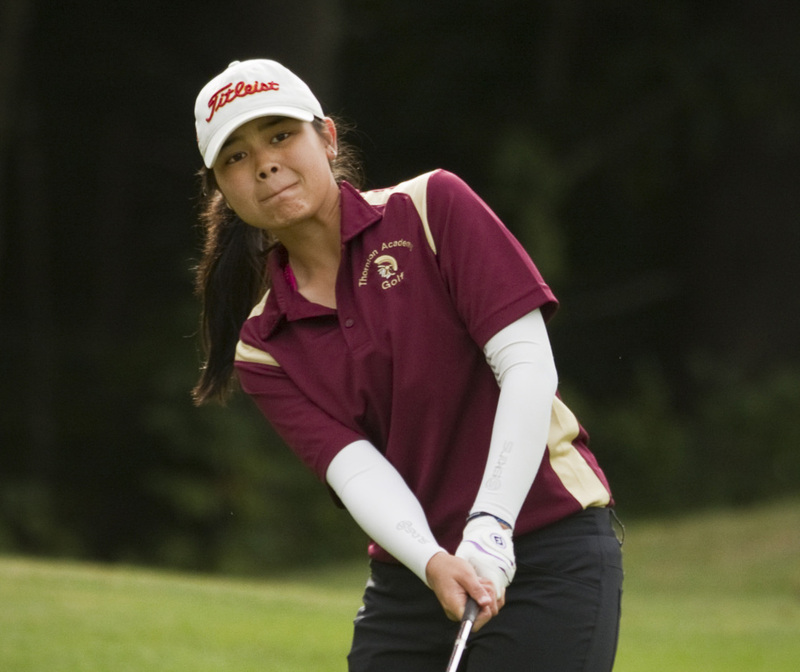 And she has adapted very well in her short time in Maine and on Thornton Academy’s golf team after coming from Jakarta, Indonesia. After starting the season as the team’s No. 4 player, she’s now No. 1, a rare distinction for females on Maine high school co-ed teams. She’s a 16-year-old junior and has failed to break 40 for nine holes only twice in eight matches while playing from the ladies’ tees. She can play. She has shot a 31 on the front nine at Nonesuch River Golf Course in Scarborough along with a 33, 34 and 35 on the front nine at Biddeford-Saco Country Club, Thornton’s home course. Other than Biddeford-Saco, Rivai is seeing these courses for the first time. She has a 35.2 stroke average. How did she wind up at high school in Maine? Thornton Academy houses international students in two dormitories. One would think a golfer would look for a warm weather school to attend, but Rivai said she was looking for more than just golf from a school. She is enrolled in several advanced courses. “My parents and I researched a lot of schools and this was the best,” said Rivai who is soft-spoken and speaks excellent English. “It’s important for me to do well in my studies,” she said. Left unsaid is how well she’s adjusted to playing golf on Maine courses. To prepare his girls’ team members for the state schoolgirl championship on Oct. 18 at the Natanis Golf Course, Thornton Academy Coach Jeff Camire took them to Vassalboro for a practice round. Playing the Arrowhead course at Natanis, Rivai shot a 3-under 69. She played with Thornton’s junior varsity coach Emily Bouchard, a three-time women’s Maine Amateur champion, and beat her by six shots. Rivai’s father taught her golf when she was 5. She didn’t like it at first, but that changed at around 10 when she said, “I started to get better.” Rivai has a full-time instructor back home. It didn’t take long for Camire to agree. At the Jakarta world junior golf championship in early June, Rivai finished sixth after leading after the first round with a 2-under 70. She finished with rounds of 75-79 for a 54-hole score of 8-over 224. “She travels worldwide to play golf,” said Camire. Rivai said she is adjusting to playing in chilly temperatures. In a qualifying tournament for the individual state schoolgirl tournament Monday at Willowdale Golf Course in Scarborough, Rivai was medalist with a 77. It was windy and the temperature dropped significantly during play. She arrived in Saco with her parents a week before school started. Her parents stayed during the first week of school to make sure their daughter settled in. The week before school, she attended her first PGA Tour tournament at the Deutsche Bank Championship in Norton, Massachusetts. At practice last week, she was wearing a green Deutsche Bank hat with autographs from PGA Tour players Jordan Spieth and Rickie Fowler. Rivai said the best part of her golf game is her approach shots, which set up birdie opportunities. “The mid-irons are the strongest part of my game. The first shot to par 3s, the second shot to par 4s or the third shot to par fives are shots I have a lot of confidence in,” said Rivai. Juniors Greg Kalagias is one of three juniors back from last year’s team. He started the season playing in the No. 1 spot, but now is No. 2. Rivai supplanted him as she did juniors Logan Picard and Noah Jacques at two and three. They have all been very accommodating and even recommended to Camire that they thought Rivai had earned the right to play in their spots. As the team’s top two players, Kalagias and Rivai are paired together in matches against the other team’s top two players. Kalagias has been impressed with Rivai’s game. “She’s very consistent and straight,” he said. When school ends in June, Rivai plans on playing in American Junior Golf Association tournaments in the U.S., some world junior tournaments and college combines. She also plans on visiting colleges and exploring their women’s golf programs. “My goal is to play college golf,” she said. Her school of choice is UCLA, one of the top programs in the country. Strong student, exceptional high school golfer and one thing more: “I’ve been told by some students that Hashilla is a phenomenal singer,” said Camire.